The problem with publishing a reference book in the standard comic format was that there was never enough space to include everyone, and there was a constant need for updates. 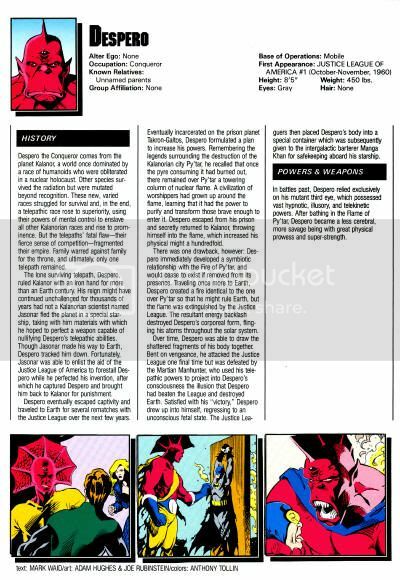 Marvel and DC came to the same conclusion with their '90s attempts: offer them in a looseleaf format so that readers could organize them and their updates as they pleased. Since entries were limited to one page (illustration on front, biographical data on back,) it was also a lot easier to sneak in obscurities among the names. However, the format proved expensive and unpopular, especially among collectors who wanted to keep their buys sealed and pristine. Further, Marvel used boring style guides for their art, and chopped their bios to pieces in favor of lists of key issues to buy. Alternately, DC offered for more attractive art here than on their original much loved Who's Who comics, and while name characters were sometimes chafed by the space restrictions, lesser lights were gifted far more room for information than usual. 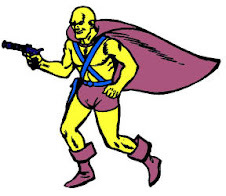 Despero didn't seem to need the space, though. Mark Waid offered a solid summary of his adventures from 1986-1990, the only years "officially" in continuity at that time, in just over two of three columns. Powers & Weapons only took up a brief paragraph. I feel this was unfair, but indicative more of the times than the talent. 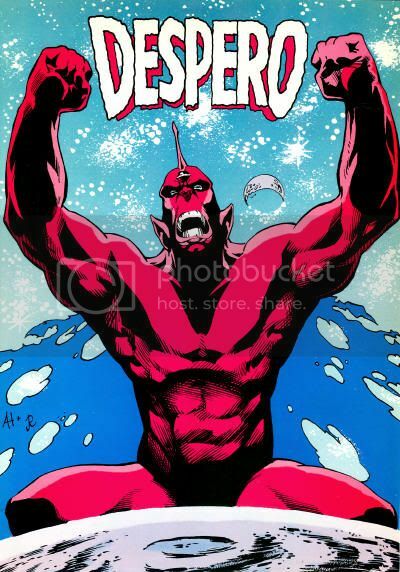 Last time Despero received surprisingly good art drawn by a writer, but this time he got Adam Hughes and Joe Rubinstein, so no complaints were to be filed. Mayfair Games Inc. complimented this series with one of the own as part of the DC Heroes line. 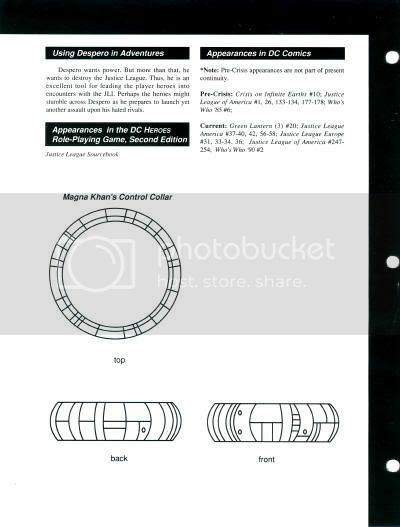 The Who's Who in the DC Universe Role-Playing Supplement 1 came out around 1992, and offered about 120 characters an additional two pages of informational text related to game play. 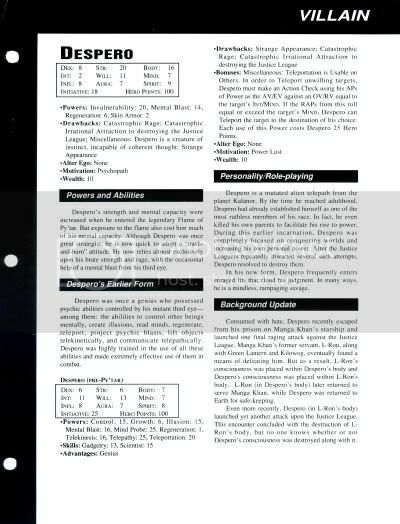 Despero's included updated stats, another paragraph describing his powers, coverage of his Pre-Py'tar form, a bit over a paragraph on his personality, and a background update. 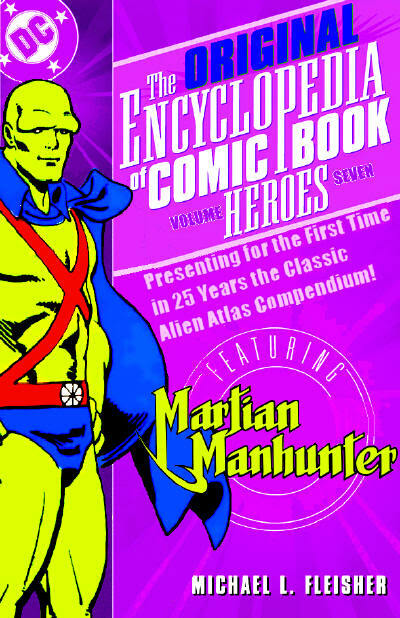 Mayfair Games even offered a checklist of his referenced comic book appearances (all Post-Crisis) and previous uses in Mayfair supplements (which had only amounted to the Justice League handbook.) 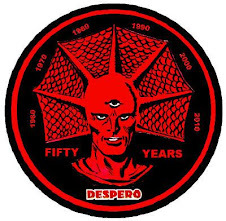 The back page was mostly devoted to a superficial schematic of the control collar used to download L-Ron's consciousness into Despero's mind. 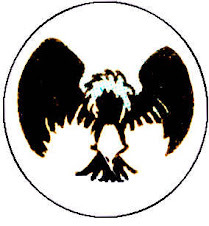 A lot of the information is still dubious ("incapable of coherent thought?") 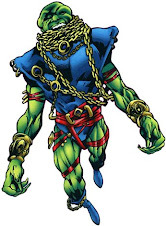 but the power levels sure shot up in this incarnation.+2 Dexterity meant he could finally connect with all but the most agile human opponents, and he added more Strength than most characters ever get. 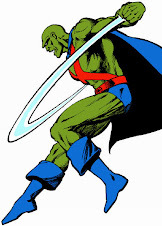 That 20 eclipsed the strongest mortal heroes, comparable with New Gods and Captain Marvel (although Shazam underperformed Mayfair's perception of Superman to a criminal degree.) A body of 16 placed him just below the likes of Superman, Darkseid and Ares. 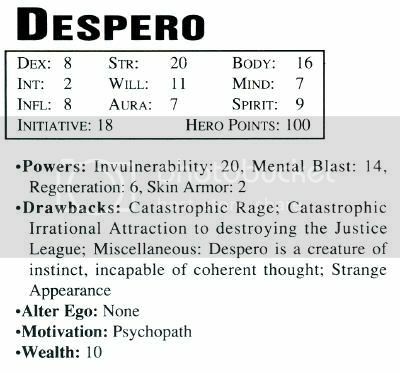 Of course, Despero also lost more in intellect than most characters ever have (-9,) and he lost 7 in Initiative. Let's not forget that impossibly high Invulnerability, which is downright unbeatable without the help of some powerhouses.